Some people’s jobs are to plan meetings. Fun, right? Think of them like wedding planners but for business; more briefcases and less brides. Our Sales Team works with these meeting planners every step of the way, from site visits to tour the property and our spaces, to planning itineraries, all the way down to “Hellos” upon arrival, and “How was your room?” while they’re here for their function. Service is about continuously striving for the next level of guest satisfaction. That’s why after each event, we send our meeting planners a follow up questionnaire so they can let us know how we did. Here’s a peek at some of the reviews theses pro-planners have left us. Retreat Room Classroom Setup on 10/21/2013. 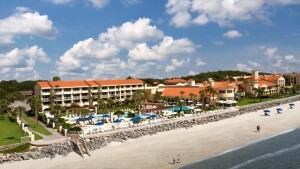 The King and Prince Beach & Golf Resort. St. Simons Island, GA 31522. Many meetings and events are held at our resort over the course of a year. Our guests come first, and each and every team member strives to provide a relaxing and memorable experience for them. After a meeting or event has ended, we ask the planner to give us feedback about their experience. Here is what meeting planners are saying about The King and Prince. “We had an incredible stay. Everyone was courteous. If we had a problem, the staff was easy to work with to get it taken care of. I was very appreciative and it made the retreat an excellent event.” -G.W. “Our ladies had a fantastic time and loved being at The King and Prince. This was perfect for our meeting and we loved Wesley Cottage.” -G.W. “We had a wonderful experience and will definitely be having more events and meetings here in the future.” -J.W. “As always, an excellent event. I received many comments from the attendees as to how impressed they were. The hotel, grounds and staff are excellent.” -D.J. “The catering staff was very accommodating to our last minute changes. . . went above and beyond and were very pleasant regarding our requests.” -B.H. “Your hotel, staff, food & service was excellent and I do mean excellent. It is so very nice and accommodating. The way our customers went on about the Saturday night meal was unreal. I enjoy dealing with professionals who are on their game and your team is. Thank you for everything. We have has some great venues in the past , this may have topped them all.” -C.S. 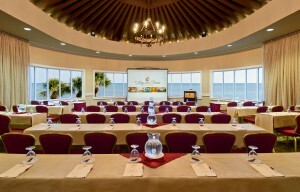 The Butler Board Room at The King and Prince Resort – complete with an ocean view! It is the goal of the management and staff at The King and Prince to make sure that every guest has a wonderful stay with us. Many of our guests stay with us for meetings and conventions and are able to enjoy the amenities the resort offers while they are here on business. “Most attendees at our convention loved the King and Prince and said that the food at ECHO was very good. They were also happy with their rooms.” -A.O. “We love the new decor!” -A. R.
“Thank you for everything. We loved The Lady Jane!” -M.W. Recent meeting awards include Convention South magazine Readers’ Choice Award, the Pinnacle Award from Successful Meetings magazine, Meeting South’s Best of the South Award and Smart Meetings Platinum Choice Award. Contact us today to find out how we can help you host a productive and memorable meeting on St. Simons Island, Georgia! Read What Meeting Planners are Saying about Our Resort! “Could not be happier with the way the event went. Great job King and Prince!” -H.S. “Great year. Very accommodating. We will definitely be back. Thank you.” -L.W. “The resort and service are excellent and that’s why we keep coming back. Staff go out of their way to make sure our event runs smoothly. They are a pleasure to work with.” -B.P. “Ruth Driggs was wonderful to work with and extremely helpful at all times!” -S.L. “Thank you! Everything was wonderful!” -D.S. “The staff here do an outstanding job and are in the top 3 I’ve experienced in 30 years of meeting planning. Great job!” -A.E. “The renovations look great!” -G.L. “Everyone wants to return in 2014. I don’t see how you can top what you did in 2013, but have confidence that you will.” -B.A. “King and Prince always does an excellent job for us.” -R.L. “Excellent support from the staff in putting on another successful conference at The King and Prince!” -J.M. “Once again, another great conference! I want to personally thank Kaitlin Rouh for her patience and professionalism!” -T.B. “It is a pleasure working with Julie. The renovations are beautiful!” -B.P. “Julie, Kaitlin & Laurie did an excellent job helping us with check-in, changes and special needs. Incredible job!” -G.L. “Many compliments from association members. A great and needed from our previous meeting location. Many thanks to your staff.”-C.F. “The entire staff at The King and Prince deserve a huge pat on the back for the outstanding service they provide to the guest. I received nothing but positive feedback from our board members and they are looking forward to returning in the future.”-P.B. To learn more about meetings and events at our resort, visit our website or call us at 912-638-3631.